As the tag-line of this blog declares, I enjoy a high tolerance for risk, both for me and for my children. Living in developing countries generally broadens one’s sense of what is and what is not acceptable danger-wise. In Vietnam, I grew used to watching children using the concrete lane divider on a busy highway as a balance beam. Every building site in Asia is covered with precarious and rickety bamboo scaffolding, and there are no safety lines for the migrant workers plastering the exterior of the sixth and seventh floors. Such gambles are everyday, and make the well-padded and liability-haunted lives of American children seem absurd. Here, we eat delicious food from dodgy-looking street stalls, and don’t bother to dry every drop of tap water off of our dishes or fruit. The children ride around town with us at top speeds in tuk-tuks, with Ascher occasionally seated in front with the driver, hanging on for dear life. We take second-class buses with high centers of gravity and without seatbelts around hairpin turns and over mountain passes. 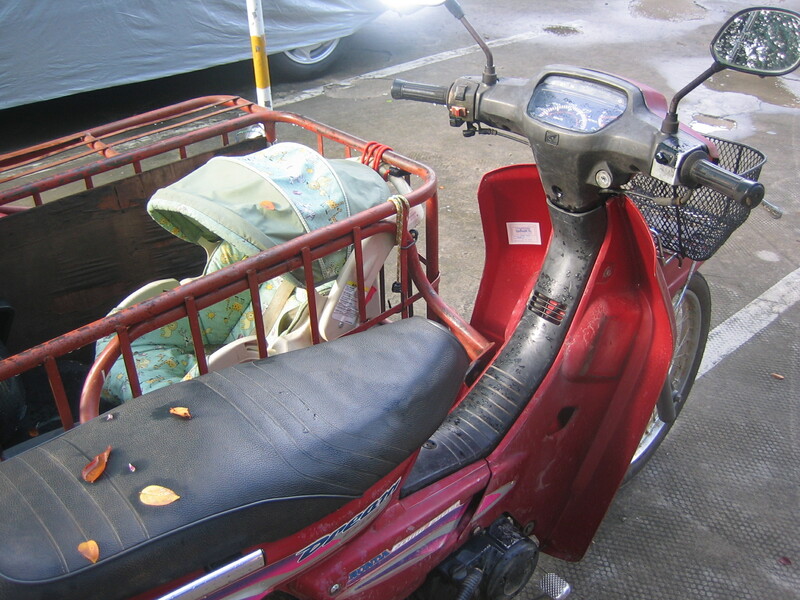 At the market, we edge our way through jostling shoppers past woks of boiling oil. 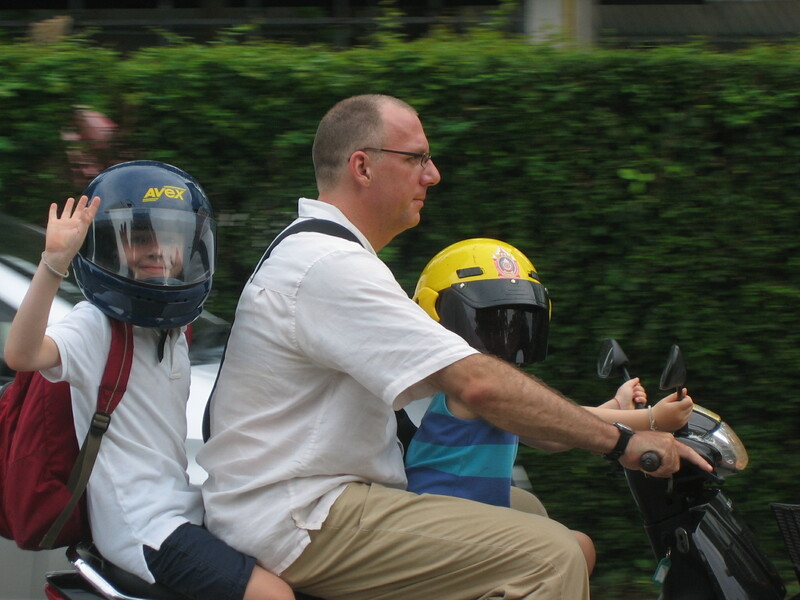 I am perfectly willing to take the kids home from school on the motorbike, Thai-family style. But there is, I’ve learned, a limit. Today at the ImmEcco hotel pool, the staff had set up the stage, lighting, and sound-system for a wedding that would take place poolside this evening. 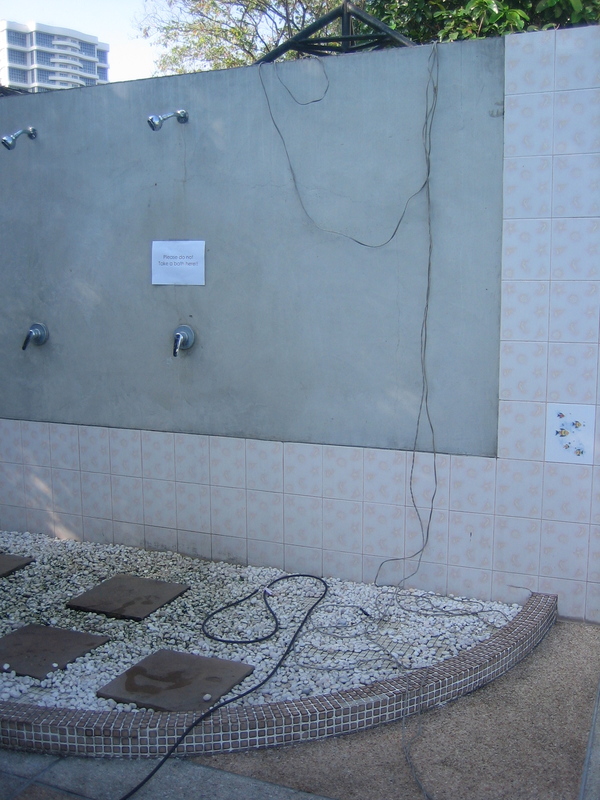 Sprouting from an ancient outlet strip on top of the wall behind the pool-side showers, various twisted and frayed cords were draped over the shower heads, snaking through the wet shower basin, and across the concrete to the pool. 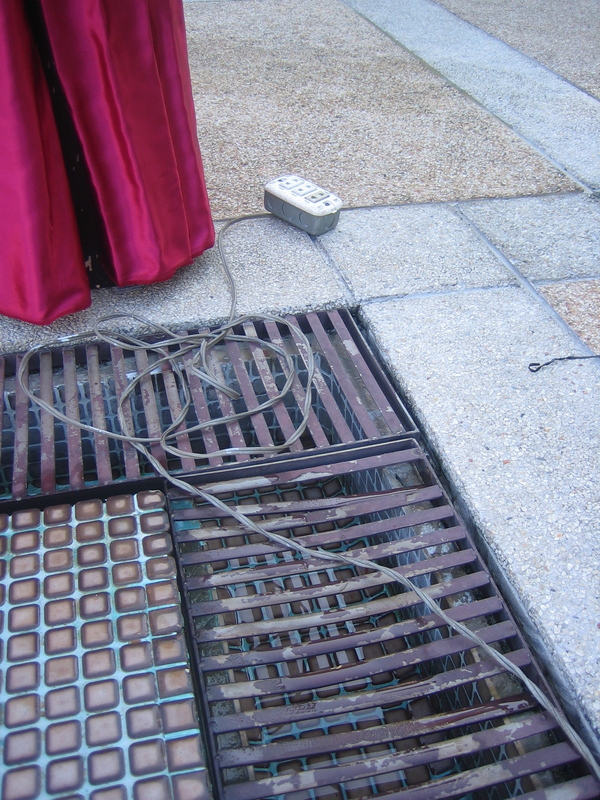 To avoid people tripping on the wires, they then ran the wires down and through the metal-grated spill-over gutters of the pool. Additional outlet strips, some of which sported exposed wires and the occasional black-tape repair, attempted to avoid blowing the circuits when the flood lights and amplifiers were all powered on. For a brief delusional moment, I entertained the very Western idea that the staff has to know what they’re doing. How could a respectable hotel not have a trained and certified electrician on hand for this sort of project? A Dutch woman who came later had a similar response: “I thought that it must be some sort of water-proof special pool system and that it must be OK.” But, of course, they weren’t using an electrician, and it isn’t some special system above the laws of physics. The likelihood of this jerry-rigged system electrocuting us–or someone at the wedding–was much, much higher than everything being OK. After we evaluated our life-insurance benefits, Ken climbed a chair to reach over the shower wall, and carefully unplugged down the morass of wires above it, cutting off the current so that we could swim. We also have opted to enjoy the Loy Krathong fireworks and firecrackers from the relative safety of our seventeenth-floor balcony, but that is a story for another post. I’ve joined your rss feed and look ahead to looking for more of your fantastic post. Every time I check in, I am totally amazed…. I wonder how many of those kids balancing on the median never made it back home. The reason we live in such a protected environment in the U.S. is because of statistics. You can’t protect what you don’t know. I like to think I’m daring because I occasionally eat food past its expiration date…but yeah, like you said, my life here is very well-padded!